WATSONVILLE, Calif. -- California's perpetual problem of groundwater depletion has gotten so dire that people are actually working to solve it. In California, groundwater deposits are getting saltier as cities and farms extract more water than is replenished naturally, allowing ocean water into the porous aquifers. One of the worst areas for it is the Pajaro Valley, a small farming community near Santa Cruz. In a state that has long touted itself as the nation's No. 1 agricultural producer, the seawater has worked its way into groundwater deposits roughly 3 miles inland from the coast. Water experts and state officials were in a conference room at the corporate headquarters of massive berry grower Driscoll's in Watsonville last week to discuss the issue and try to amplify it. "The state of California has to deal with groundwater, or we're going to ruin this state," said Miles Reiter, CEO of Driscoll's, which has operations in six states as well as Argentina, Canada, Chile and Mexico. Driscoll's executives are uncommonly frank about the hard realities California is faced with because they are unavoidable in the Pajaro Valley, which gets more than 90 percent of its water from groundwater. Some farmers in the valley are already at the point where their groundwater water is too saline to use. "There are a handful of customers that take our delivered water; their wells have gone so salty they can't irrigate with it," said Brian Lockwood, senior hydrologist for the Pajaro Valley Water Management Agency (PVMWA), which completed a pipeline in 2008 to deliver recycled irrigation water to Monterey and Santa Cruz counties from a recycled water treatment plant. "It's only our delivered water that keeps their farms running." Reiter has been working for the last five years to save water and help implement a 2010 goal by the PVMWA, which in cooperation with the U.S. Geological Survey found that the basin needs an average of 12,100 acre-feet of water returned back to it each year in order to balance the deficit. "There's more storage, more recharge, less extraction by better farming, and maybe less extraction by areas not being farmed," he said. "And it's all got to add up to about [12,000] to 18,000 acre-feet in a normal year." With first-ever state groundwater regulations signed last year and implementation looming, state agriculture and water officials are hoping Driscoll's will serve as an example for others. The company hopes to bring the basin into balance much sooner than 2040, as the state law requires (E&ENews PM, Sept. 16, 2014). That doesn't mean they're looking forward to it. "It's going to be a nightmare if the thing's successful; it's really going to be an awful experience," Reiter said, "only exceeded by the experience of not doing anything." Driscoll's won't say exactly how much water it and its growers use per year, but it's a lot. 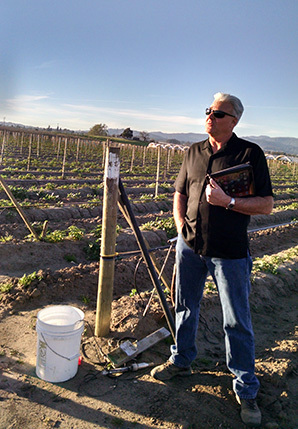 Watsonville, Calif., berry farmer John Eiskamp touts the benefits of using sensors to check soil moisture depletion. Photo by Debra Kahn. "We are a conglomeration of independent growers who account for many agricultural acres in the region," said Emily Paddock, Driscoll's northern region water resource manager. "We recognize that Driscoll's as a whole is a significant water user, but we don't represent the majority of the water use in the Pajaro Valley." Overall, farming uses 80 to 85 percent of the water in the Pajaro Valley annually, according to Lockwood. "Of course, agriculture is also the primary economic driver in the valley," he said. The valley received $800,000 in January from the U.S. Department of Agriculture's Regional Conservation Partnership Program that was funded by the 2014 farm bill. It's going toward the Resource Conservation District of Santa Cruz County, which is part of the "community water dialogue" that Driscoll's began in 2010. The Resource Conservation District gives out funding for projects, including a wireless irrigation network like the one at Driscoll's grower John Eiskamp's berry farm in Watsonville, which uses ceramic-tipped sensors to measure moisture in the soil. The data lets Eiskamp adjust irrigation levels to more precisely meet the plants' needs and prevent overwatering. Driscoll's is also spearheading a new campaign with other businesses and environmental investor group Ceres to call attention to the state's water issues and participate in the implementation of the groundwater law and the spending of a $7.5 billion water bond approved by voters in November (E&ENews PM, March 5). "Driscoll's' collaborative approach is really emblematic of what we hope to accomplish with this campaign statewide," said Kirsten James, Ceres' senior manager of water and climate policy. While the valley's groundwater depletion has been going on for years, it's exacerbated by the statewide drought, as depletion accelerates when rainfall doesn't enter the aquifers. Driscoll's started working on this in 2010, after decades of hand-wringing and strife among farmers and water agencies on the central coast. At one point in the early-to-mid 2000s, a $200 million import pipe was under consideration, which the PVMWA backed away from in 2010 due to community opposition. An initial triumph was an agreement published in a local newspaper that made three declarations: The Pajaro Valley is important for agriculture, the import pipeline is not an option, and there will be "costs and sacrifices" required to bring the aquifer into balance. "As the dream of large scale water importation has faded, we must now find ways to live within our means," the agreement says. That includes capturing rainfall, then using it to irrigate or putting it back underground; capturing irrigation water for reuse; and even stopping farming on some lands. "Everybody is worried about this, whether they admit it or not," Reiter said. "And it's really sort of liberating to just quit arguing about if there's a problem and who it's going to damage the most and kind of reach out more broadly." Now, they have quarterly meetings and a fairly steady supply of funding for projects like a recharge basin at a Watsonville ranch, which allows runoff from the Santa Cruz Mountains to filter back into the ground, and a project to limit the use of sprinklers to plants' rooting phase only. "I'd say the biggest step was acknowledging there was an issue and acknowledging we're part of the problem, so we have to be part of the solution," Reiter said. "That seemed to liberate a lot of other people to say, 'So are we, and we're worried about it, too.' The dialogue became much more civilized and has led to some positive steps."